In my opinion, if you think you’d enjoy your signature more by having it framed, then I’d have it framed. But, in terms of resale or market value, removing the page from your paperback would be a misstep and detrct from value. Yes, keep it in the book. 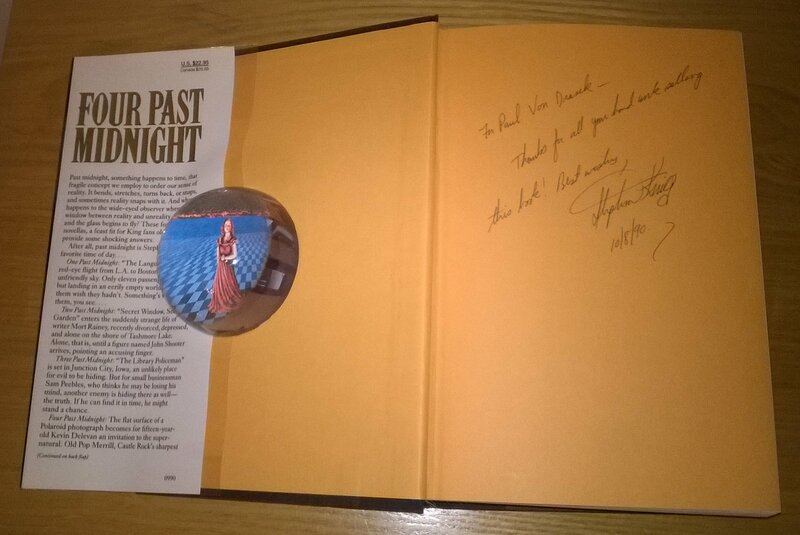 What’s the current value of a signed Four Past Midnight first edition with an older signature? BTW, that's just one opinion. There are quite a few people here who could render an opinion (much appreciated). My local Half Price Book Store has been getting in a lot of 1st/1st Stephen King Paperbacks. I've been buying a couple at a time as they come in. I got the first 3 Signet Dark Tower books 1st/1st, in NF condition and wondered what they were worth. As you got them from your local Half Price Book Store, they are worth that! Or half of that, anyway. Or maybe double what you paid for them. But then I was never good at maths. They get their books from shops who cannot sell them. So there is no demand at full price. Well they may not be worth much but there in really good condition and I'm collection all the 1st/1st early paperback editions so I'm happy. Found someone with a copy of IO Magazine #10 (1971, first appearence of Brooklyn August). I havent seen it, but was wondering if his price of $100 was resonable or not. Im not in the market right now, but if someone else is, i could follow up on it. $100 is resonable. The last one sold at Betts went for $125. Can I please ask for the current market value of the following...? Was there a lettered edition of The Gunslinger? If so, what’s it valued at? I’ll remember to check the catalog first someday! Thanks. Any idea what market value is on these things?